Susan Bowers, (nee Yurenka) passed away peacefully in her sleep on April 17th, 2017. Mom was born on October 30, 1926 in Luky, Czechoslovakia to Paul and Katerina Yurenka. The oldest girl of four siblings, she and her family migrated to Canada in 1933. The family started and ran an orchard and vegetable farm in Mission Flats. 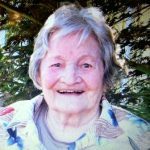 She attended Stuart Wood School, worked as a waitress at the Top Hat Diner and became a rancher’s wife when she married Arthur Bowers in 1950. They settled in Cherry Creek and had three children Lillian, Fred and Katherin. Mom loved the outdoors and especially loved to garden. Through the years she added onto the flower and vegetable garden until the yard expanded to an impressive size. Folks liked to visit the ranch and Sunday afternoons were often spent with friends sitting in the shade of a tree enjoying tea and home baking. Mom never sat still, she was always busy sewing clothes for herself and for her family. She made many quilts processing and using the fleece to fill them. She was interested in decorating cakes and made them for many, many people. When our parents retired and moved to Paxton Valley, Mom took up painting. They would travel to Yuma in the winter and meet up with old friends there and Mom’s paintings reflected the different landscapes through their travels. Mom moved to the city in 1984 and lived in Valleyview until her move to Pine Grove Care home in 2008. Her last years were spent in the care of an excellent staff and we thank you for everything you did to keep her safe and happy. 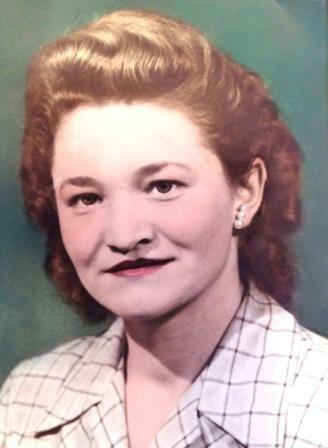 Mom was predeceased by her husband in 1987 and her three siblings, Steve, Anne and Irene. She leaves behind her three children, two granddaughters, Melissa (Brandon) Haney and Sarah (Paul) Brugger, and four great grandchildren. A remembering of her life will take place at an informal tea July 9th, at the Bowers Ranch from 1-4. Family and friends are invited to attend. I’m very sorry to hear that another old friend has gone. We spent many winters in the same community in Yuma. Sue and I took painting lessons together. My husband Russ and I visited with your parents in Paxton Valley several times. Later, I also sometimes stayed with your Mom while on my way to visit family in Chase. Your mother and father were both great people!